It seems that fossil fuels will continue to be the primary energy source in decades to come. However, solutions for the accompanying problems – for example greenhouse gases – have to be provided. LEWA and Burckhardt Compression have taken up this challenge. In the future, both enterprises will jointly manufacture systems that increase the production capacity of oil while decreasing the emission of ecologically harmful gases. Since the global oil reserves keep dwindling, methods of enhanced oil recovery (EOR) have been deployed in the extraction of oil for many years. In this process, chemicals or gases like carbon dioxide are injected into oil fields in order to increase the underground pressure and reduce the crude oil’s viscosity. Thus the oil is virtually pressed upward. Thanks to this method, the yield of a reservoir can be up to 60%, whereas only 20% to 40% can be achieved with primary and secondary recovery. In the course of the partnership between LEWA and Burckhardt Compression this EOR will be combined with the carbon capture and storage technology (CCS). The seminal CCS technology is arguably one of the most effective means to reduce the emission of greenhouse gases into the atmosphere. This is because acid gases, such as hydrogen sulphide (H2S) and carbon dioxide, that occur during oil production are captured and sequestrated. Afterwards they are stored in underground rock formations. The agreement that was officially sealed during a meeting in Leonberg on 27 August 2012, unites competence leaders from the fields of pumps and compressors: LEWA is the leading manufacturer of process diaphragm pumps and metering and mixing packages for process engineering. Burckhardt Compression is one of the world’s largest manufacturers of reciprocating compressors. The company is recognised as the only compressor manufacturer of a complete range of Laby® (labyrinth piston), Laby®-GI, Process Gas and Hyper compressors. With their combined know-how the companies have managed to develop a process that allows for a highly energy efficient compression. Unlike ordinary compression processes, this so-called hybrid approach makes use of an intermediate step: the gas liquefaction. First, the semi isothermal compression is conducted in multiple stages by the reciprocating compressors from Burckhardt Compression. After that, cooling and liquefaction follow. Eventually a LEWA triplex diaphragm pump boosts the liquid up to the required pressure (up to over 400 bar). The overall power saving due to liquefaction can be up to 15% because the power consumption for the compression of liquids is lower than for gases. Operators also benefit in other ways: corrosion problems that in case of carbon dioxide occur in compressors at relatively low pressures can be avoided in the liquid phase. Furthermore, variable flow rates and gas compositions can be handled by the use of speed control, thus enabling a constant high efficiency. Also changes in the reservoir pressure are not disruptive because the system boosts the liquid to the final pressure in one single step. However, the cooperation is not limited to the joint development and manufacture of these systems. In order to facilitate a trouble-free planning phase, and, subsequently, a perfect functioning, the part-ners are constantly exchanging information – with each other and the future system users. Thus the expertise of both partners is available to the customers at consultancy meetings as well as during engineering and before and after the initial commissioning. The limit for piston compressors and diaphragm pumps lies at approximately 150t/h of acid gas. In terms of carbon capture and storage, the CO2 emissions of many carbon dioxide generating processes and fossil fuelled power plants of 200 – 300MW can be handled with one set of machines. Power plants of 200 – 400MW would need two or three sets of machines. 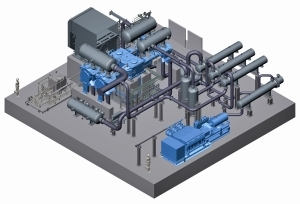 The range above (up to 1200MW) would be the field of multistage turbo compressors. Such extreme requirements pose a big challenge to the sealing systems of a package. In order to meet this challenge typical LEWA qualities like hermetic tightness of diaphragm pumps and the broad experience of Burckhardt Compression in the field of CO2 compression, especially within the supercritical area, are crucial.